Bladder cancer refers to any of several types of malignant growths of the urinary bladder. The image to the right shows a papillary cell tumor, the most common type of bladder cancer. 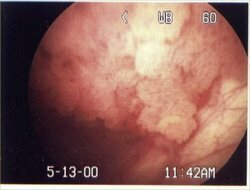 Papillary transitional cell carcinoma is a cancer of the transitional epithelial cells of the bladder. The greatest risk factor for bladder cancer is a genetic predisposition; it is also associated with smoking and occupational exposure to aniline-based dyes (such as in textile factories), as well as with petrol and other chemicals.